Discovery is crucial for any successful project and yet you’re always under pressure to reduce how long you spend on it, or skip it altogether. This results in a poor understanding of the business problem, incomplete requirements, delays, unexpected costs and a bad experience. Skore is at least 5 times faster than traditional approaches for discovery, design and analysis. Saving up to 75% of the cost of discovery while keeping everyone engaged for longer. Instantly generate business requirements, improvement suggestions, job descriptions and quantify the benefits of any proposed changes. Not just for analysts and consultants but the WHOLE company. A simple and easy to adopt approach that makes YOU an expert in any business process. Discover people, processes, data and technology at the speed of conversation in live capture workshops and get everyone on the same page. Share what you’ve captured securely with the wider team on any device anywhere in the world. Gather feedback and comments to ensure you’ve got everyone onboard. Generate job descriptions that accurately show how each person interacts with the rest of the business. All at a single click. 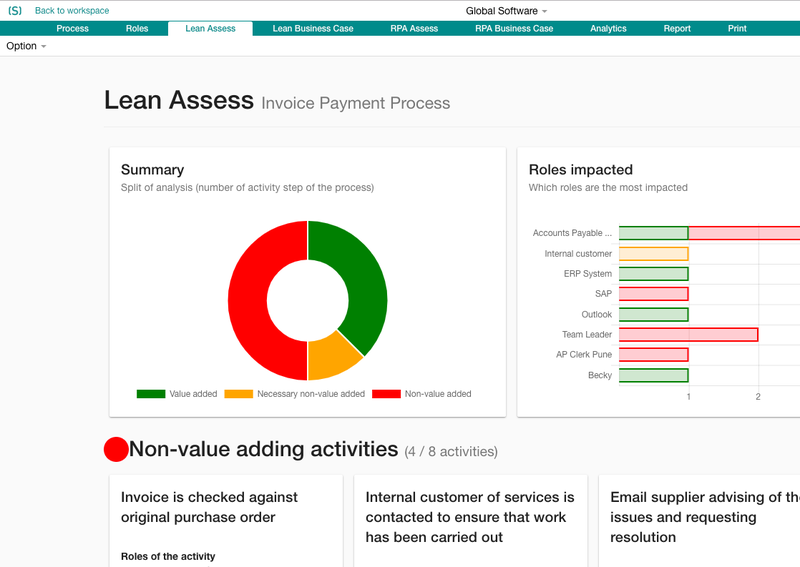 Easily identify process improvements that make a real and measurable impact to the business. Communicate and implement these changes all from a single place. Clearly show how much time, cost or risk you can remove from the process through the improvements you are making. You’ve created a valuable asset, now use it. Anyone in the business can access, zoom in and out of the detail to quickly understand where things are and how they work. Here are some of the industry sectors that are delivering transformation right first time with better discovery and higher levels of engagement. Get customer experience right first time by creating a single unified view of the customer journey and its supporting processes. Onboard customers quickly and securely while reducing costs and risk. Get the build process right first time by quickly discovering and standardising key controls and processes across sites and regions. Ensure delivery of high quality homes while easily demonstrating compliance with rules and regulations. Deliver better learning outcomes right first time by creating an agile and motivated workforce. Reduce costs and maintain quality through effective mergers and shared services. Deliver rapid growth, wow customers and build confidence with investors. With Skore your team will be perfectly aligned and setup for success. Tell us what you’d like to know and we’ll be in touch. Join the Skore mailing list — we won't share your information with any third parties and you can unsubscribe at any time.